I’d like to welcome Ellen back with her second guest post for us! If you remember, in her previous article she talked about boundaries and how they can impact on our sense of SELF. She discussed the signs that tell you how to know when your boundaries are being violated. You can find her previous article here if you’d like to refresh your memory. If you endlessly to give (or take from) others, feel guilty, don’t speak up for yourself or rescue others, chances are that you’ll find this new article helpful. In it, Ellen talks about how you can set healthy boundaries. This promotes feelings of self-esteem and shows yourself and others that you are worthy of respect, appreciation and love. Sometimes though, implementing boundaries can be tough. Emotions such as guilt and fear can show up, and others can try to blame you or behave badly, providing you with some difficult challenges and often sending you into hiding. However if you start small you can ease into the groove of boundary setting. Try practising what you want to say, and set boundaries with the little things that really don’t matter much. Once you feel a little more comfortable, move on to some of the bigger things. And as Ellen suggests below, talking with a professional counsellor or psychologist can help. Hi again. Nice to see you. Last time we talked about personal boundaries – what they are, how they help us and how, if they’re not firmly in place, they can have a negative impact on our relationships and our self-esteem. Today I’ve got some tips on how to establish strong personal boundaries. Your time. If you are clear about what you will and won’t do to help other people you will be able to make good decisions about how to use your time. Your time is yours and while it’s always lovely – and good – to be able to help others, your time is also finite. There is only so much of it you can give away. When we bend over backwards to always help others, whether it’s family, friends or colleagues at work, we give away our time and that leaves less for ourselves. And you and I know that there’s precious little of that to begin with. Think about where others might be crossing your boundaries in terms of your time. Do you have people in your life who are always asking you to help them out? Is there someone at work who requests your assistance to do things you know they are capable of doing themselves? Do you have family members who regularly drop in when it’s not convenient? Identify where your time boundaries are a bit loose and tell people that things need to change. Be firm but respectful. Don’t feel afraid to tell others that you’re sorry but you can’t help them this time. They might be a little put out at first but you will feel better for asserting yourself and they will come to respect your time as yours. Encourage them to find solutions on their own, and in the case of inconvenient visitors, make a plan to catch up at a time that’s better for both of you. Your emotions. Your emotions are precious, and they’re Positive and negative emotions keep us balanced and healthy but you need to protect them with good boundaries. If you let others say hurtful things to you your ability to manage your emotions lessens and, long term, this can lead to anxiety and depression. Be alert to hurt caused by other people in your life (sometimes we get so used to this behaviour that we stop noticing it – we just feel the hurt) and be ready to say something. People can say hurtful things without realising the impact that it has. At other times they might know exactly what they’re saying and they’re trying to push your buttons. Be clear on what you will and won’t accept from others and tell them when they’ve crossed the line. Try phrasing it as, ‘When you said…., I felt…. Please don’t speak to me that way.’ This can be hard, it takes practise and it won’t always work out as well as you might hope but if you’re firm and consistent you’ll feel better about you and other people will eventually get the message and their respect for you will grow. Your values. Have you ever been upset by someone’s behaviour but you weren’t sure why it affected you the way that it did? You might have been agitated about a partner’s drinking, or a child’s friends or a friend’s partner! At times we experience what psychologists’ call ‘dissonance’ between the actions of others (and ourselves) and our values. Our values are our personal standards of behaviour or our beliefs about what is important in life. If you have strong beliefs – or values – around what is and isn’t acceptable behaviour in relation to alcohol use, for example, and someone close to you is drinking up a storm on a regular basis, this can be really upsetting. This is a tricky one because ultimately we can do very little do change other people and the way that they act. You might find that just being aware that your emotions are stemming from dissonance between your values and the other person’s behaviour can be very empowering. You can then decide how you’re going to respond. You might alert them to the issue and ask them to not behave in that way around you. Or you might chose to remove yourself from upsetting situations. Talking it through with a counsellor or psychologist can be really helpful too, particularly if the situation is complex. A bit of brainstorming with a professional can really help you to clarify your boundaries and to come up with ideas about how to handle certain situations. Above all else, having good personal boundaries starts with knowing who you are and what’s important to you. Spend some time in self-reflection and feel confident that you have the power to make boundaries work for you. If you’d like to read more, here are some great articles. Ellen is a Psychologist, author, mum. Melbourne-born, she spent most of her 20s and 30s in Sydney and now lives in beautiful Ballarat, in the Victorian Goldfields. Ellen writes stuff to inspire and sometimes to challenge. She knows a lot of stuff about how people work at work, how people are different and unique and how people make the most out of life. 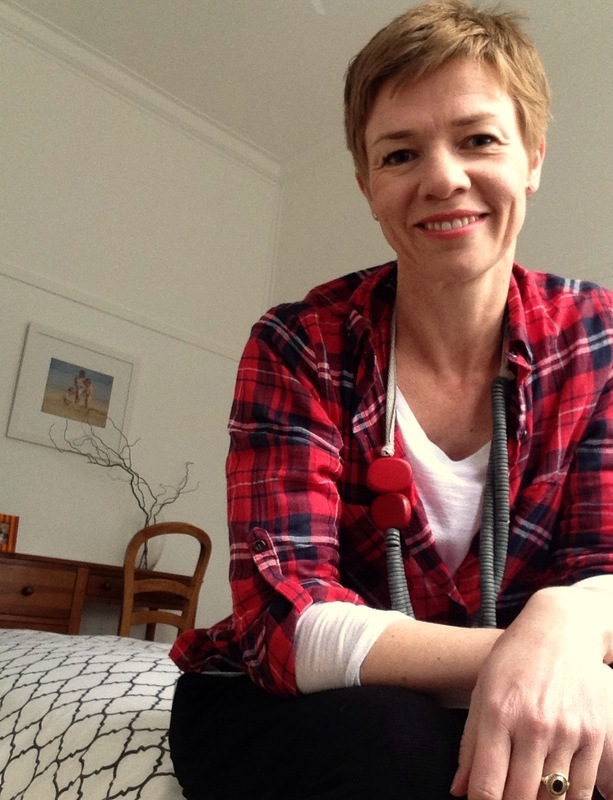 Ellen writes at www.potential.com.au or if you’d like ask a question or share a story she’d love to hear from you! You can email her at psych@potential.com.au. One of the key points I made in my last post was that there are no conditions on our worthiness for being on this earth. 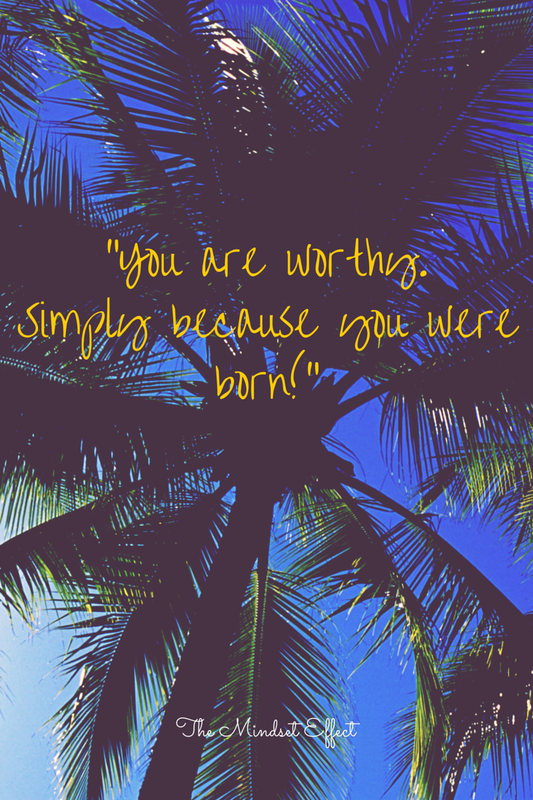 We have value and worth simply because we were born. Note the full stop at the end of that sentence. The event of our birth gave us the right to be worthy. We need no other reason to believe in ourselves. And yet, as described in the last post, every day we place conditions on ourselves. Our upbringing, our environment, the things other people say and do, all influence the way we feel about who we are. 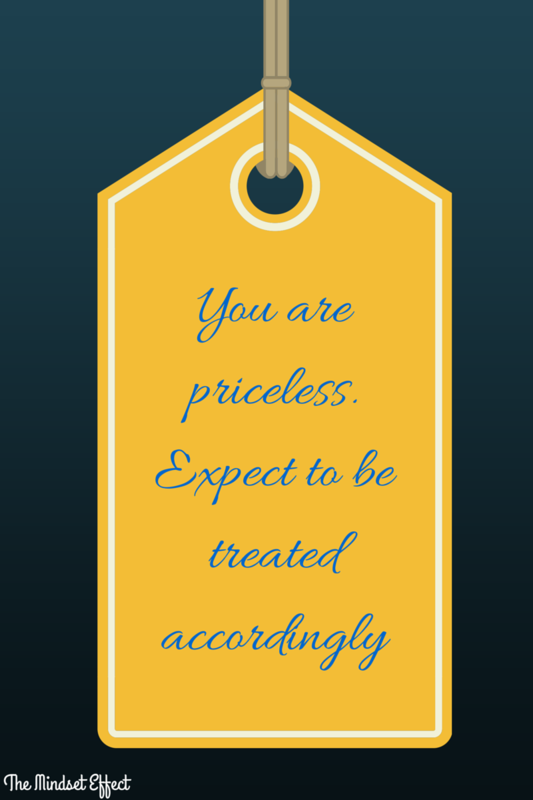 When we feel like we don’t deserve the worth we were born with, we treat ourselves abysmally. We put ourselves down, we call ourselves names, we hate ourselves and we judge ourselves. 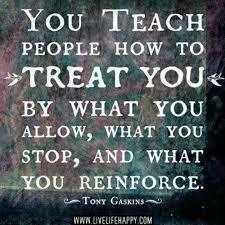 And in this, we inadvertently teach and allow others to treat us the same way. Whenever we voice our inner hate or call ourselves an idiot or mumble under our breath about how much of a failure we are, we reinforce the belief that we are unworthy. Have you ever had the experience where someone you love has used you for their own gratification? Maybe your kids refuse to help out around the house. Maybe your brother repeatedly borrows money without paying it back. Maybe your best friend invites herself over all the time, talks about her problems, dumps all her stuff on you, and walks away, leaving you feeling wrung out. Or maybe your sister criticises everything you do. In any of these situations you may end up feeling unappreciated, taken advantage of and used up and spat out. You may feel resentful and angry, and wonder why anyone would do these things when all you’ve done is given from the depths of your heart to help the people you love. You may have things churning in your mind about what would make these people treat you in such a way. And you could very well feel hurt that your generosity and the heart of your spirit has been abused. You would feel like every thought and emotion you’ve ever had about how unworthy you are has been confirmed. Which, of course, keeps you in the cycle of allowing others to treat you horribly. If you believe that you are worthless, how do you think you’d feel if people treated you with respect, kindness and consideration? Would you believe it? How would you respond? It’s very likely that you’d minimise it, reject it, dismiss it and walk away from it. You may even attack the person providing it. But what if you did believe it? If you believed you deserved love, consideration, respect and gratitude, how would you respond? As someone who has believed both sides of this coin, I can tell you that your response would be worlds apart. You’d expect that people would show you gratitude and respect. You’d likely appreciate their compliments, accept them gracefully and feel pleased when you hear them. One thing is certain. You’d never accept it when people treated you disrespectfully. When you believe in yourself and your worth, you also believe that you deserve to be treated well. And when someone in your life doesn’t do that, you will naturally protect that sense of worth by placing boundaries around yourself that you don’t allow people to cross. Especially the people who say they love you. So, if you feel like you’re being used, abused and taken advantage of, rather than looking to others for blame and justification for the way you feel, try looking internally to how you feel about yourself. If you can improve that, the way forward will become clearer.